Sparring entrants, waterfalls and wearable LEGO were my experiences this year. I have a few sources to thank for pushing my boundaries. Madison for her Wyldstyle cosplay a few years ago and Cole for his social experiment come to mind. Also, the partial pieces of clothing and armor that other builders have shown off over the years. When I first played around with staggering rows of 2L rubber technic axle connectors on axles I had no idea how large that table scrap would grow. That little thought grew until it became a pair of flip-flops. Then they got fancy. Then they needed something more so I played around with the same concept in a different way. I used a bunch of 2L technic liftarms and connected them with 3L pins. Once I figured out the pattern I could run long strings. These strings then were fastened together and suddenly I was a weaver, creating large swaths of cloth. With a little finagling I was able to convert these large chunks into form fitting pieces. Thus, a dress was born. 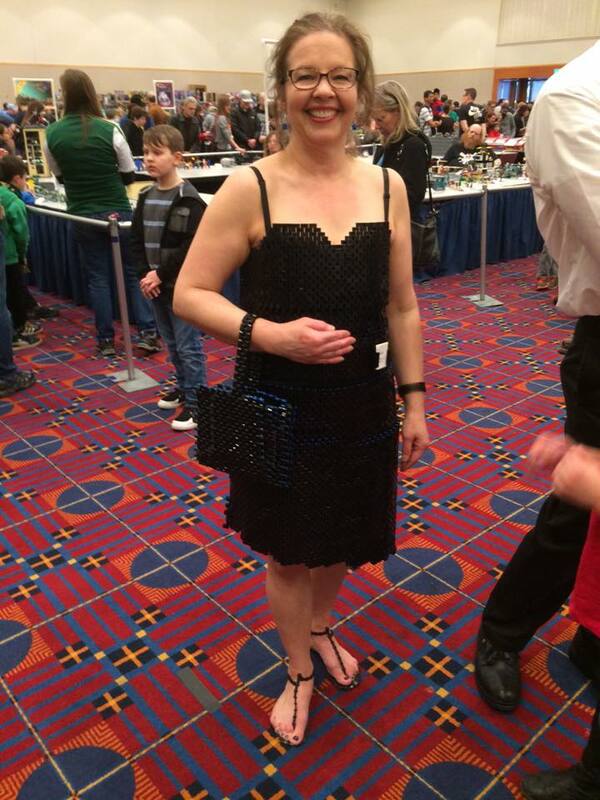 "Little Black Dress" was my feature MOC at the convention. My wife was a willing participant in showing it off. I made her a handbag to match and added a few small touches. I then complemented her with my own LEGO built belt, bowtie and glasses. Being already near sighted it would have been nice if the window glass was prescription. You can see the dress featured on CNET and MSN! With a choice to enter into either the Art or Technic theme, I chose the latter. The coordinator was very intrigued by a true bio mechanical sculptural build. Didn't even need any motors or battery packs! Runs on protein and water. Taking that cue from Cole, we walked around the public expo together, wowing the crowd and vying for the People's Choice award. And the competition was pretty stiff. We had to compete with an 8' Multnomah Falls. A Steam Punk build, "Sea Haus" also sported a moving waterfall. These proved to be real crowd pleasers. In the thick of it was Cole with his life size light sabers which he was letting the crowd hold and feel. Who lets the public touch their LEGO!? What a smart guy. To make it even more memorable, Cole and I got into a very friendly grudge match with good natured trash talk and a bit of jovial intimidation. He really is a great guy and if he ended up with the People's Choice award I would have clapped the loudest. Maybe even cheered. In the end Multnomah Falls cascaded to a People's Choice victory and the Sea Haus punked us on Best of Show. Both fine entries worthy of their trophies. Who loved us the most? Tweenage girls, followed by most females. Many of the guys were reasonable enough to ask first before snapping photos or feeling the dress. Older folks seemed to really love us as well. Must have been a Ginger Rogers / Fred Astaire vibe. My wife and I both appreciate that the LEGO community has kept their comments positive and non creepy, unlike a few random ones on Twitter and the like. LEGO people really are some of the nicest most respectful people I've met. You can buy a copy of the same bowtie I wore. Great for a geeky wedding party or prom night! I won that trophy in Technic for the dress. But also art anyway for my enlarged Dag's Bricks. In a sideways related note, I recreated the classic LEGO wooden sewing machine for the Classic category. I laid a large piece of the "fabric" over it and won a small Fabuland set as runner-up prize for that theme as well. On top of all this I coordinated the Microscale theme and was given a thank you prize for that as well. And did I mention that Bricks Cascade is one of the most generous LEGO conventions there is? In door prizes alone I received about $400 worth of bulk elements this year. 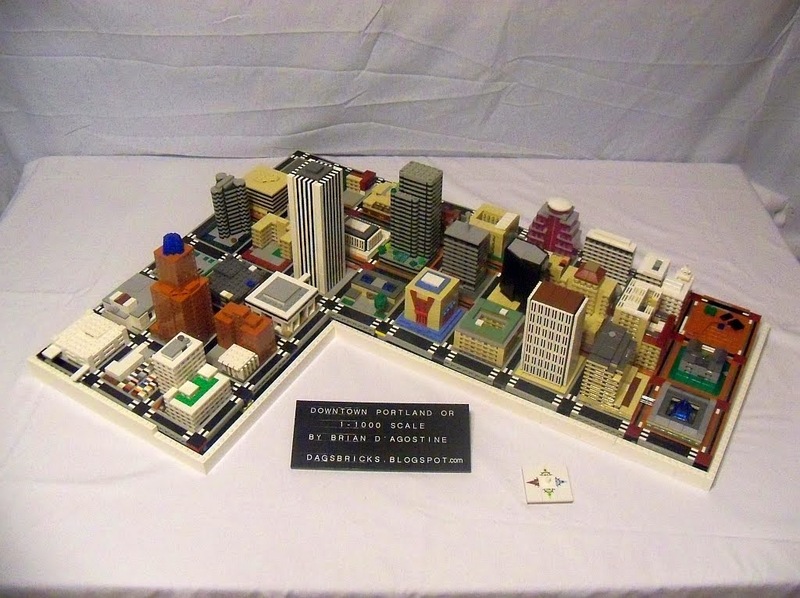 Include the 3 large prize sets valued at around $360 and at least $30 for the Fabuland set and I count almost $800 of street value, not including the brick built trophies. All for one $55 convention ticket. The door prizes alone would have more than covered that. I should mention too that as a theme coordinator I counted it pure joy to build trophies for others. I built three large and two small trophies and didn't hold back my creative process. Rather I felt that these were some very generous trophies and I was pleased to give them out. I look forward to the next year when I can snag either of those coveted grand trophies. In the meantime, I've got some fashion designers to talk to. Something about couture with a virus?